To me the Sunflower is the prettiest flower of them all. Even on a rainy day I can look in the backyard and see the brightness and feel the warmth of the sun through my sunflowers. Not only are these flowers pretty they are a major food supply for birds, especially the Morning Dove. 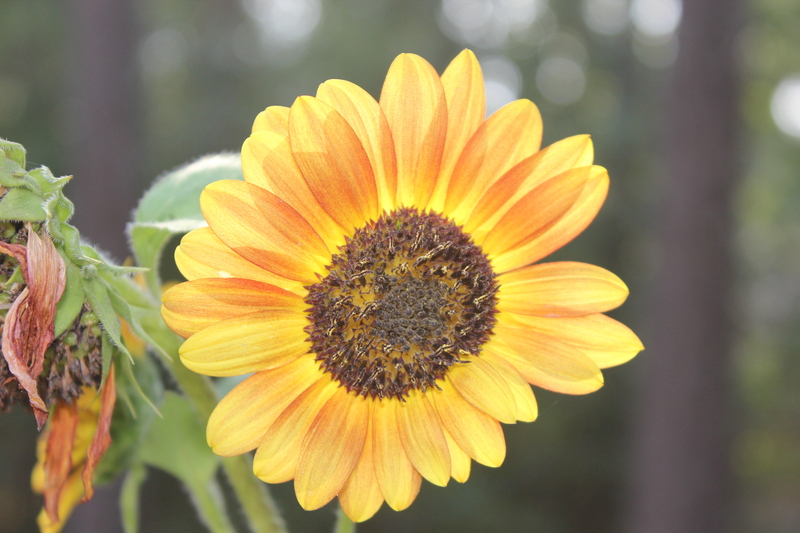 When the sunflower first blooms it provides nectar for the bees, butterflies and Humming Birds. After the petals of the sunflower have fallen to the ground and the center turns dark the smaller birds come to feed off the sunflower. Many seeds fall to the ground , providing food for the Morning Doves. The Morning Dove relies on other birds, animals and man to put the seed on the ground for them. I’ve been told that the dove will not even scratch the ground for their food, others have to lay it out for them. This entry was posted in Flowers and tagged bees, butterfly, Humming Birds, morning dove by Mud. Bookmark the permalink.